✅ Trip Verified | Excellent little airport. A bit tired cosmetically but everyone was friendly and everything worked seamlessly. Don’t rush through security unless you’re desperate to look at aeroplanes as there’s not much else to do. 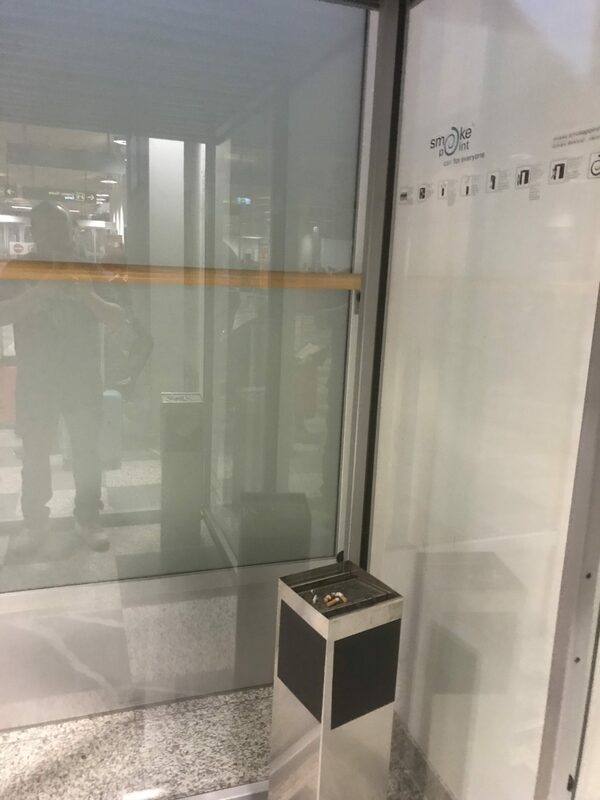 There’s a little smoking box that takes 4 people after security next to gate 4 upstairs. It’s free and the ventilation works well. 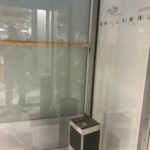 Not Verified | Terrible airport - could not check in for ages and nowhere open to eat or buy food/drink until we had gone through security. The food available after security was ridiculously expensive and tiny portions. We got our water filled up but the woman told us she wasn’t supposed to allow people to have free water and when I pointed out the cost of plastic bottles on the environment she said that the airport didn’t care about that and just wanted people to spend as much money as possible. Avoid at all costs, Slovenia is an incredible country but I would advise coming via Croatia, Italy or Austria instead! ❎ Unverified | Avoid at all costs! This used to be a reasonable airport, nothing special but at least flights were punctual. This seem to have degraded in the last couple of years. Queues at this airport resemble a rock concert. I have been to many airports around the world but have never had to wait 2 + hours for a simple baggage check (and, sadly, this is the rule rather than exception). Flights are almost always late and frequently cancelled. Absolutely no care for passengers' itineraries. If you are planing a trip, try to avoid this airport, particularly if your itinerary involves connecting flights. "very laid back and friendly experience"
✅ Verified Review | Upon leaving Europe back to Los Angeles my flights had me departing LJU to connect at CDG for my flight to LA. For some reason my travel agent had booked the two flights separately under two different confirmation numbers. while in Slovenia I had called the airline, and even the hotel's concierge did as well, and we both found out only the gate agent can make sure and both flights are listed as one continuous trip, mainly for the sake of routing checked luggage all the way through. The gate agent, with the assistance of a co-worker easily got this done and I was only charged $35 for an extra checked bag (my initial flight was in economy, while my connecting flight was in business. Thankfully both flights were on the same airline, in the end everything went smoothly. Upon arrival at LJU I was amazed how much of a small town airport feel it had. You could walk through the entire airport in 15 minutes. There were only about four check-in/ticket windows and no one was in line. Proceeding to security there were about three rows to enter through, and once again, no one else was in line. My time initially at check-in took about 10-15 minutes (to get my flight/s worked out and to pay the extra checked bag fee) and then within ten minutes I was through security and enjoying a drink near my gate. A very laid back and friendly experience. Sort of a calm before the storm I would have at CDG in three more hours. "arrival process was quick and professional"
❎ Unverified | LJU is a small airport, offering all the necessities to provide a quality trip experience. I travel often, and always appreciate the smaller, convenient airports. The arrival process was quick and professional. The departure was also quick, with friendly staff at the counter. Compared to other European airports, I add LJU towards the top, mainly due to it's size and easy access to restaurants and gates, and also for the convenience of shuttles and buses directly outside the terminal. It appears to be a well-run operation. ✅ Verified Review | Ljubljana is a small airport with short walking distances but the main part is outdated. Where almost all Eastern European airports have updated infrastructure, Ljubljanas terminal is more than 40 years old. There is not much to do to kill the time except a wellworking and fast WIFI. Small add-on with 4 jetbridges was built in 2007 and thats the only part of the airport which matches worldwide standards. In morning and evening rush hours, there is long security lane queues and lack of seating space at the Schengen bus gates. After standing there, the standing continues at the bus which is used for gate to aircraft transfer. Adria's CR9 take 86 passengers and where other airports use 2 Buses for 86 pax, in LJU you get squeezed into one in summer without air conditioning. "memorably pleasant and stress free"
Very rarely have I been able to go through an airport with such quickness as Ljubljana. It is a small compact airport and does look cramped with shops and airline counters. There are clear signs in English. A bus awaited us on arrival to take us into the airport terminal - very short ride. I was out of the building in less than 2 minutes. The departure was similarly fast. Even with the security check which involved taking out your computer and liquids - I was at the gate in just 5 minutes though several flights were scheduled over the next hour. Immediately after the security check is a large duty free shop carrying the usual products and a small selection of Slovenian items. There is also a small coffee shop selling basic fayre. The gates are right in front though a flight of stairs leads to a few gates upstairs where the larger planes board. Large glass panes lets you gaze out. Enough comfortable seats around including several "massage seats" which could be activated by euros. A modern easy to get on and off bus took us to the aircraft located off the terminal building. The beauty of the airport's setting - ringed by mountains - could be glimpsed from the large windows of the bus on the short ride. All in all, a memorably pleasant and stress free airport experience! 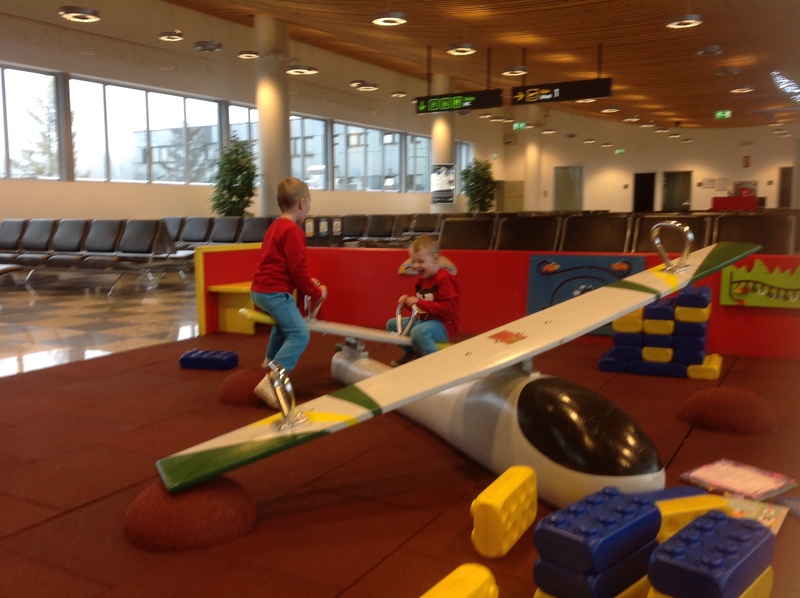 Ljubljana Airport has everything you need - but in miniature. It's now our 'local' airport for ourselves/friends to and from the UK. You can drive up to the terminal building to drop/collect people (though last time I noticed they seemed to be fitting some sort of barriers). There is a multi-storey car park directly opposite the terminal (30 mins free) On the 7/8 times I have been there this year, there has never been more than a couple of people in front of you at check in. Security has taken about 5 mins and once through there is quite a good duty free. Passport control has only ever taken a couple of mins and there is another cafe and duty free shop after that. There are 8 air bridges so we've never been bussed out onto the tarmac. 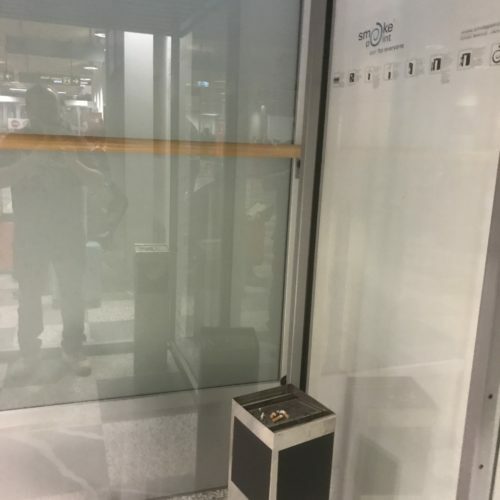 For the smokers there are 'cabins' before and after passport control. You can probably walk the length of the terminal in less than 5 mins so it doesn't take long to get anywhere. Flying in is just as painless. Passport control is manual (no E-gates). If you have an EU/Swiss passport then select the left hand queue - it moves quicker. 2 luggage belts seem to cope and we haven't waited more than 5 mins for bags. Not sure what it's like at peak ski season with skis etc. Only complaint is the price of long term parking - it's expensive. An alternative is to use the Adria Airways car park. It's about 5 mins walk but about half the price. "a very pleasant airport to travel from"
This is a very pleasant airport to travel from that I visit often. Although it is very small, transport links are excellent, and service is good. Shuttle buses to Ljubljana will take you to any address (and even collect if you pre-book) for 9 euros. Sometimes queues extend around the departure lounge, which has a post office, a few shops, a dining hall and cafe. The cafe has good coffee and pastry deals. Security is very efficient: two desks in a small area which you rarely have to wait long for. Past security there is plenty of seating downstairs, again with cafe serving traditional cakes. Excellent to have unlimited free wifi without login required, always reliable right up to boarding tunnel. Passport control upstairs is again quick, with two security desks. Beyond this there is less seating, but usually enough, and quite a few accessible power sockets. Arrival area past baggage claim is very small (basically just a cafe) but people seem to always move through quickly. "airport is small and easy accessible"
Ljubljana Airport is small and easy accessible. There are two security gates to access the departure area, but everything goes smoothly. If you do not want to wait, it is recommended that you register before for the card Fly Ljubljana (it is free online) and you can have the priority boarding and use the priority line for the security. It saves you time. After the security you have two departure areas - on the ground floor and on the first floor. First floor is renewed, bathrooms are better upstairs. If you have children, you have a very nice children's playground on the first floor (and even if you departing from the ground floor, you can use the playground upstairs. You will be at your gates on ground floor in 2 minutes). Free strollers for rent are available on the first floor by the elevator. Business lounge is very nice, you get some cold refreshments (no hot ones) and the rest rooms are very nice. At the arrivals there are only two luggage belts, but everything goes smoothly. You are outside in less than 20 minutes after landing.